After two days of better than 800-point closing rallies, the trend may have changed. The Dow surged for a 1,086-point gain on Wednesday after a 340-point decline early in the day. On Thursday the Dow was down -609 at 2:30 and roared back 869 points to close with a 260-point gain in the last 90 minutes. On Thursday evening the S&P futures have traded as high as +9 and remain positive as I type this commentary. This is the first time in weeks that I remember the futures being positive after a big gain. The two 800+ point rebounds must have convinced some traders that the bottom is behind us. Here is the challenge. Tax loss selling should have been over last week. Monday's 600-point decline was due to the attack on Fed Chair Jerome Powell and Treasury Secretary Mnuchin calling the heads of the top 6 banks to ask if they had enough liquidity to weather the storm. That immediately created worries that the government knew something we did not, and the market crashed again. Fast forward to Wednesday and the early dip was bought causing a monster short squeeze. As expected, the market opened lower on Thursday after the 1,086-point Dow gain. Nobody in their right mind would have expected the index to just continue higher. Thursday's rebound was a confirmation of Wednesday's bullishness and another short squeeze after the 600-point intraday decline. Friday should see a continuation of short covering but also the possibility of profit taking given the big rebounds. Monday's unexpected high-volume drop could have poisoned the outlook for the coming Monday, also a very low volume day in normal years. Starting on Tuesday we are in a new tax year and everyone who has been white-knuckled over the last several weeks just waiting for the tax year to roll over so they could bail on existing positions, will have their chance. It could be a choppy week and the partial government shutdown will be blanketing all the news outlets because the new House members will be on the attack. With the Dow moving in 500-1000 point swings, selling premium is still going to be a high risk trade. If the Dow can gain 1,000 points it can also lose 1,000 points. Volatility remains extremely high and two days does not make a trend. I did recommend some plays this week, but they are based on the assumption the market should be flat to positive over the next couple weeks. That could be a flawed assumption given the new tax year and the unknown results. Our remaining December positions expired at the close last Friday. There was no material change from the prior week. The McKesson position was closed at the open while it still had value. The market continues to be crazy with 500-1000 point intraday swings. We are holding at new lows. Selling premium in this market is suicide. Given the potential for a directional change I am going to try and launch a couple new positions. This is still a high-risk market for premium sellers. Shares dipped on the 18th to touch $160 but were immediately bought. Prices have rebounded to $169 and are holding at recent highs. Sell short Nov $155 put, currently $2.55, stop loss $165.50. Buy long Nov $145 put, currently $1.15, no stop loss. Update 10/4: No specific news. Shares rolled over with the market to stop us out on the short put. Closed Nov $155 short put, entry $2.70, exit $3.40, -.70 loss. Retain Nov $145 long put, entry $.80, currently $1.60. AAP took a dive on Wednesday after Walmart said ti was partnering with AAP to create a specialty qutoparts store on Walmart.com. I don't see the reason for the decline since this will help AAP compete with O'Reilly and Autozone. AAP only does $9 billion in annual revenue and the sector generates more than $100 billion in sales. It sounds like a win-win to me. Shares dipped to $154 on the announcement but have rebounded $8 since Wednesday's low. Sell short Nov $145 put, currently $2.10, stop loss $155.85. Buy long Nov $135 put, currently $1.00, no stop loss. Apple broke out over $230 to a new high on Wednesday. Thursday's $4 decline was only a partiao retracement of their $13 gain over the last week or so. There is very strong support at $217 and Apple should post killer earnings on Nov 1st on strong iPhone sales. We will exit the day before earnings. Sell short Nov $210 put, currently $2.73, stop loss $223.50. Buy long Nov $200 put, currently $1.46, no stop loss. Update 10/11: The Nasdaq crash stopped us out of the short side on the Apple position. I am recommending we close the long side because Apple is going to rebound in any positive market. Closed 10/5: Nov $210 put, entry $2.67, exit $4.10, -1.43 loss. Close Nov $200 long put, entry $1.47, currently $4.70, potential gain $3.23. Adobe raised guidance this week and helped to kick start the Tuesday rally. Shares retraced some gains but assuming the market does not make new lows, Adobe should be an out performer. Sell short Nov $225 put, currently $2.02. Stop loss $236.85. Update 11/1: It should be no surprise that a 14% decline in the Nasdaq in three weeks caused us to be stopped out of Adobe. The monster market decline on Monday afternoon spiked put prices on everything causing us a big loss. Closed 10/29: Nov $225 short put, entry $1.64, exit $5.00, -3.36 loss. Adobe has not closed behind its 200-day average at $239 since January 2016. The stock tried to sell off in the Nasdaq decline but support at $238 was strong. Sell short Dec $220 put, currently $2.70, stop loss $236.85. Update 11/16: Adobe had not broken its 200-day since January 2016. However, the second Nasdaq correction dip was too much negativity. Not only did the 200-day break but also the support at $238. Closed Dec $220 short put, entry $3.00, exit $5.80, -2.80 loss. Facebook shares have been depressed for two weeks but the last two days the stock has begun to rebound. Even if it does not move up from here, it has held support for the last two weeks. Sell short Nov $160 put, currently $2.62, stop loss $159.00. Buy long Nov $150 put, currently $1.17, no stop loss. Update 10/4: The report of a new hack into 50 million Facebook accounts caused the shares to collapsed again and make a new five-month low. We were stopped on the short put and the long put is still active and profitable. Closed Nov $160 short put, entry $5.50, exit $6.45, -.95 loss. Retain Nov $150 long put, entry $2.41, currently $4.55, stop loss $160.50. Facebook shares fell hard again on news of the new cyberattack. However, Facebook always seems to bounce back from these types of revelations. 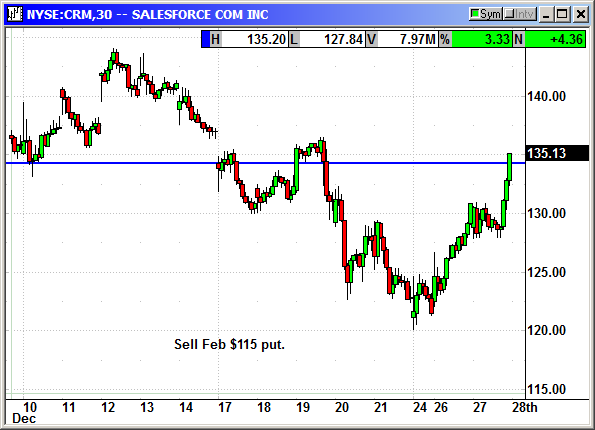 We are going to sell a put spread nearly $20 OTM and the stock is trying to cling to the $160 level. Sell short Nov $140 put, currently $1.94, stop loss $154.50. Buy long Nov $130 put, currently .83, no stop loss. Update 10/11: We were stopped out of the short side the prior week on the news of a new hack of 50 million accounts. We retained the long put and we were rewarded when shares fell in the Nasdaq crash. Closed 10/5: Nov $150 long put, entry $2.41, exit $5.40, +2.99 gain. Previously closed Nov $140 short put, entry $5.50, exit $6.45, -.95 loss. We were also stopped on the lower put spread. Closed 10/8: Nov $140 short put, entry $1.83, exit $2.48, -.65 loss. Close Nov $130 long put, entry $.79, currently $1.43, +.64 potential gain. The bad news is priced into this stock. There was another round of negative headlines on Thursday and it recovered quickly from the opening dip. There is a reasonable chance that $140 remains terminal support. Sell short Dec $130 put, currently 1,75, stop loss $139.75. Buy long Dec $120 put, currently .79, no stop loss. Update 11/29: Facebook did not wait for the market crash on the 20th. Shares continued to implode almost immediately upon entry into this position. FB appears to be gravely injured and while still a great business model, there are warts popping up everywhere. Closed Dec $130 short put, entry $2.37, exit $2.70, -.33 loss. Close Dec $120 long put, entry .93, currently .43, -.50 loss. Update 12/13: We closed the leftover long put at the open on 11/30. Closed 11/30 Dec $120 long put, entry .93, exit .51, -.42 loss. Five below is a specialty retailer similar to a Dollar General or Dollar Tree but everything in the store is less than $5. Like the rest of the sector, the stock has been up and down multiple times in 2018. The correction low was $110 and I am using a spread below that level. Sell short Dec $105 Put, currently $1.95, stop loss $116.00. Buy long Dec $95 put, currently .95, no stop loss. Update 11/29: FIVE gapped down -13 with the market on the 20th to stop us out. Closed Dec $105 short put, entry $1.86, exit $2.90, -1.04 loss. Retain Dec $95 put, entry .76, currently $2.18, stop loss $107.85. Update12/13: FIVE gapped down -13 with the market on the 20th to stop us out. We had a long put with a stop loss and the stock gapped up more than $5 on the 3rd to stop us out of that long position. Closed 12/3 Dec $95 put, entry .76, exit $1.00, +.24 gain. Lam posted decent earnings and guidance and spiked to $154 on the news. 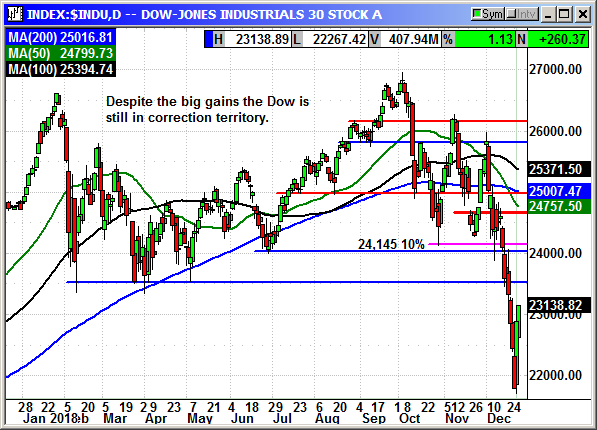 The week market has seen some of those points bleed away but there is strong support around $143. Sell short Nov $125 put, currently $2.00. Stop loss $139.85. Shares peaked at $164 the prior week and have declined to $157 on the market weakness. LULU has a nice base built and could go higher but the strong gains since last December suggests there may be more sellers than buyers in the weeks ahead. Sell short Nov $170 call, currently $2.00. Stop loss $163.25. Buy long Nov $180 call, currently .79, no stop loss. Medifast was knocked for huge loss from $260 to $181 last week on no specific news. Shares had simply gotten ahead of themselved and profit taking appeared. After the instant rebound they have held over $210 and are faithfully following the 50-day average higher. We are going to sell a put $40 out of the money. Sell short Nov $180 put, currently $4.80, stop loss $207.25. Update 5/11: We were killed on MED and the stock barely moved. It opened down $1 on the 8th then dipped lower as the day progressed. We were stopped in the opening minutes before there was any major decline but the short put opened at $13 and twice the premium we sold. This was a $180 put with the price at $212. The market makers were taking advantage of the week market to jack up the premium. We were caught in the trap. 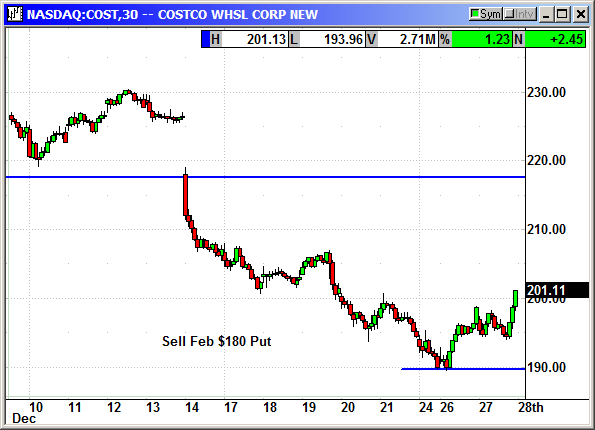 Closed 10/8: Nov $180 short put, entry $4.70, exit $13.90, - 9.20 loss. Update 12/13: We closed the short put on the 30th. Closed Dec $180 short put, entry $2.51, exit $.23, +$2.28 gain. Retain Dec $170 long put, entry $1.35, currently .15, no stop loss. McKesson is rebounding strongly out of the market crash and is now $12 above its correction lows. Sell short Dec $120 put, currently $1.95, stop loss $122.50. Buy long Dec 110 put, currently .75, no stop loss. Update 11/29: We were stopped on the short put in the 600-point gap lower on the 20th. Closed Dec $120 short put, entry $3.10, exit $2.87, +.33 gain. Retain Dec $110 long put, entry $1.20, currently .35, no stop loss. Medifast crashed on earnings and has been moving sideways for a week. There is a minor uptick visible over the last several days. I believe the selling is over and we should be safe at $140 unless the market continues tanking. Sell short Dec $140 put, currently $2.35, stop loss $148.50. Update 11/29: Medifast gapped down $6 with the market on the 20th to stop us out. No specific news. Just a weak market. Closed Dec $140 short put, entry $3.00, exit $4.70, -1.70 loss. 3M is rebounding out of its post earnings crash lows and any positive news out of China would send it into the stratosphere. Earnings disappointed but the stock is recovering. Buy long Dec 170 put, currently $1.45, no initial stop loss. Shares got a bump this week after Evercore ISI upgraded their target price to $400. Shares spiked to a new high before fading slightly in the Nasdaq decline. I firmly believe we will see $400 next year but that does not mean there is no risk at $250. This strike is $30 OTM but Nvidia can move quickly. I am counting on the Nasdaq coming back to life soon. Sell short Nov $250 Put, currently $4.40, stop loss $264.85. Update 10/11: Nvidia imploded in the chip wreck that was helping to drive the Nasdaq lower. We were stopped for a big loss on the short put when the Nasdaq gapped down on Monday. Closed 10/8: Nov $250 short put, entry $3.67, exit $9.00, -5.33 loss. PVH shares were hammered after earnings to bottom at$131.60. Shares are rebounding after two weeks of consolidation. Sell short Nov $135 put, currently $1.70, stop loss $139.85. Buy long Nov $125 put, currently .60, no stop loss. Update 10/4: No specific news. Shares rolled over with the market to stop us out on the short put. Two weeks of gains evaporated in three days. Formerly Restoration Hardware, RH shares fell nearly $40 after earnings. Over the last two days they have rebounded sharply after the CEO bought $1 million in shares in the open market. Last week the company opened its largest store, a 95,000 sqft giant in New York City. It cost the company $50 million but the CEO believes it will produce $100 million a year in revenue. 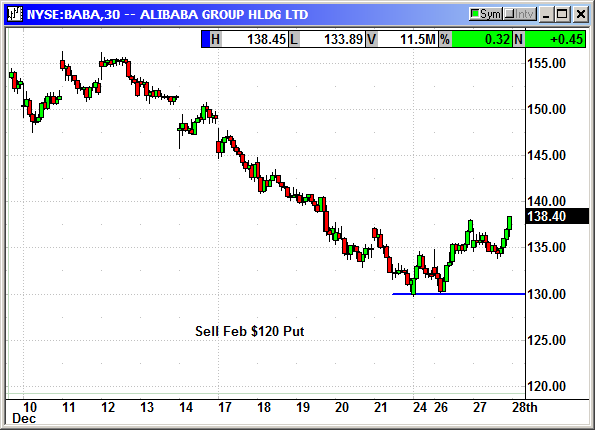 Sell short Oct $120 put, currently $2.30, stop loss $127.65. Update 9/27: RH dipped just enough on the market decline on Monday to stop us out of the short put position. Closed Oct $120 short put, entry $2.33, exit $1.95, +.38 gain. Roku closed at a new high on Thursday and after the week of consolidation it may be ready to run again. Sell short Nov $60 put, currently $2.20, stop loss $68.50. Update 10/4: Roku declined $11 in three days after making a new high on Monday. There was no news. We were stopped on Wednesday for a breakeven. Closed Nov $60 short put, entry $2.17, exit $2.11, +0.06 gain. Shopify has reboundex sharply from the November 20th low. Shares have rebounded to their mid November resistance at $151. If the positive market continues, SHOP should also break out and continue higher. If you feel like living dangerously and taking a walk on the wild side, short puts on Tesla on Friday morning. The SEC sued Elon Musk about his going private tweet. Shares fell $37 in afterhours to close at $270. The Nov $200 put is quoted at $3.90 at the close. After the post close news you can bet the stock will crash at the open however, now that the bad news is in the market, it may not decline the entire $37. Either way the put is going to spike in value because investors do not know where the decline will stop. I suggest if it declines to $250 that would be a hard floor. Any opening print put premium is likely to be enormously high and eill evaporate quickly once the stock finds a bottom. Sell short Nov $200 put, currently $3.90, stop loss $247.50. Update 10/11: Thank you Elon Musk for being an idiot. This would have been a great put position if Musk had kept his mouth shut. (tweet) He launched an attack on the SEC and shares gave back all their rebound gains. We escaped with a gain ourselves but it would have been much nicer had Musk lost his phone. Closed 10/5: Short Nov $200 put, entry $7.43 exit $5.90, +1.53 gain. Ubiquiti posted great earnings and spiked higher. After a couple days of post earnings depression the stock is rising again and closed at a new high on Thursday. Sell short Dec $100 put, currently $2.05, stop loss $105.50. Buy long Dec $90, currently $1.05, no stop loss. Update 11/29: UBNT gapped down -$5 with the market on the 20th to stop us out. No specific news. Just a weak market. Closed Dec $100 short put, entry $2.50, exit $4.50, -2.00 loss. Retain Dec $90 long put, entry .96, currently .43, no stop loss. URI fell from $170 to $106 in the market crash. In two days it has rebounded $19 and has a long way to go. The bottom at $106 was tested for six consecutive days and held. Sell short Dec $105 put, currently $1.75. Stop loss $110.75. Update 11/15: Shares of URI ended their rebound attempt and rolled over with the market on Thursday after the election. Closed Dec $105 short put, entry $1.70, exit $2.35, -.65 loss.